Read Doug Does: Slovenia (Day One) HERE. And calm the wildest storms that ever blew. With gentle soothing will be healed by you. And from my lips sweet words again shall pour. Zorjan is located in the hilly Tinjska Gora area of Slovenian Styria – this guy is virtually off the google search map, which, when one considers the quality and originality of the wines, is very surprising. Božidar Zorjan’s philosophy is that there is a sacred connection between land, animals, man and nature. He does not use any chemicals, his sheep have names and come running when he calls, and their only job is to fertilise the vineyard. He believes that animals belong on the land rather than in the stables– they are as free-roaming physicians, mapping and monitoring the rhythms of nature. The farm itself lies on the southern slopes of Pohorje, where there is a strong bond with Žice monastery. Žice monastery is an important part of European culture and history and is intimately connected with the place and people. More than a thousand years old history of the Carthusians ended in 1782, when Emperor Joseph II, in the spirit of enlightenment reforms in Europe, ordained to close down leading Carthusian monasteries which had large estates. 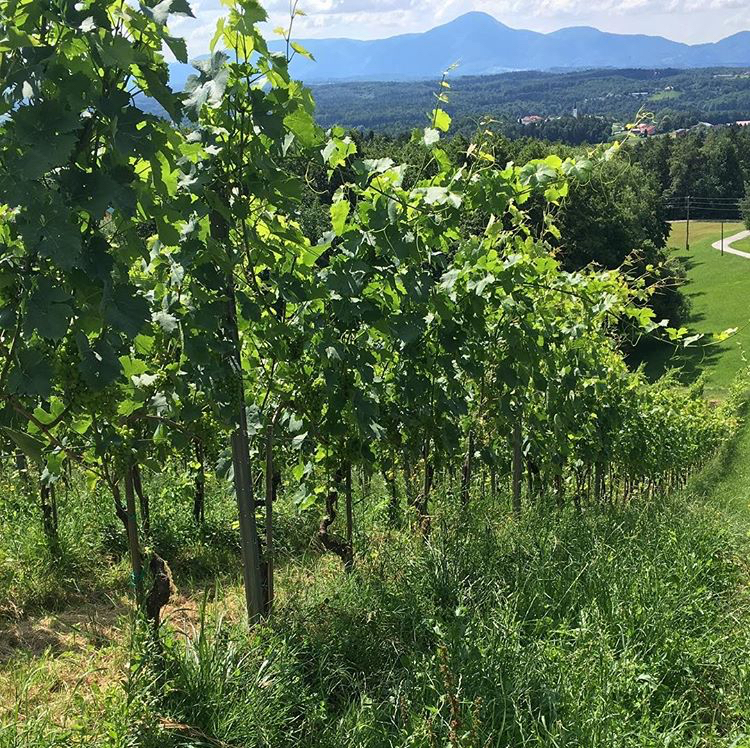 Thus, vineyards spread out over Pohorje region from Slovenske Konjice to Maribor, where they also had stocked cellars for storing wine and residing. After the closure of the monastery, the clergy sold its land and buildings. Zorjan’s ancestors bought a little land and a small cellar for wine storage, an original part of which is still preserved. The rich tradition of viticulture binds this family to continue production of natural wines with a spirit, body and soul. Life in the embrace of Pohorje forests is exceptional. Pohorje is composed of igneous rocks, which are covered only by a very thin layer of fertile soil; therefore, there is a lot of forest. In clearings, there is a thicker layer of fertile soil, where fields, vineyards and secluded farms spread out. There is always a gentle wind blowing, whispering the eternal song of life. A former police inspector, and as far removed from the woolly jumper brigade as you can imagine, Božidar speaks at great length and with great erudition about the philosophies underpinning biodynamics. He reminded us that Steiner himself was a scientist rather than a farmer, although he was to invoke and then codify age-old farming practices based on observations of natural phenomena. 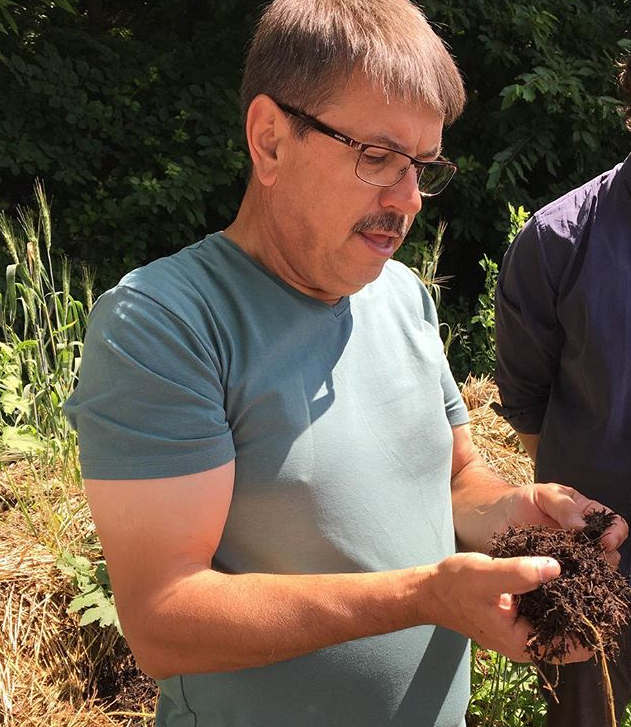 Biodynamics, I suppose, looks all around by looking down (at the soil, at the farm an organism, at the human being at the apex of the farming activity, as it were, and at nature – and the earth – in a universal holding pattern. At the local organic level, there can be no synthetic chemicals or mechanical irrigation, anything which diminishes, dilutes or disrupts the natural order. A true biodynamic farm must also grow a variety of fruits and vegetables, and there should be animals, either domestic or wild, to keep this miniature ecosystem in check A biodynamic farmer is one who listens and learns, takes his or her cue from the surroundings, ritually observes and works with rhythms of nature. After the admiring the striking panorama of mountains and forests we are invited to stroll through a meadow, pausing briefly a cherry tree to eat some of the tiniest crimson-juiced wild cherries, and then into the woods along a meandering muddy bumpy path. We are here to see the small herd of deer that Zorjan raises. We speculate why he should be keeping deer – could it be that the horns have magical biodynamic properties or that deer poop has special fertilising powers? No, deer bladders are required in biodynamics to be stuffed with yarrow flowers and buried in compost piles. And the venison salami is bloody fantastic. Sauntering around the back of the house we greet the miniature sheep (too short to reach the bunches of grapes) including some very vocal lambs. Božidar shows us his orgone which consisted of a vertical tube with a crystal on top of a box. As far as we understand this is based on an idea (an invention?) by psychoanalyst Wilhelm Reich (1897–1957), which Reich said could produce rain by manipulating what he called “orgone energy” present in the atmosphere. Or perhaps it was an idea related to the “cloudbuster”, one intended to be used in a way similar to a lightning rod. By focusing it on a location in the sky and grounding it in some material that was presumed to absorb orgone—such as a body of water— it would draw the orgone energy out of the atmosphere, causing the formation of clouds and rain. Reich himself conducted dozens of experiments with the cloudbuster, calling the research “Cosmic orgone engineering”. How this device worked to deter hail-filled clouds I have no idea – the expression ionospheric bubble was bandied around, which added to the mystery wrapped in a riddle inside an enigma. Nevertheless, or because of this, we christened this impressive piece of apparatus “the cosmic cannon”. Less arcane was a cauldron filled with sulphur residue. Zorjan explained that active sulphur was an essential substance which needed to be fed back into the earth to nourish the soil. He claimed that only real sulphur (sulphur taken from an active volcano) would work – his sulphur was sourced from Mount Etna. He boils it and works into a paste for composting. We are taken into a room dedicated to biodynamic preps sans phones. 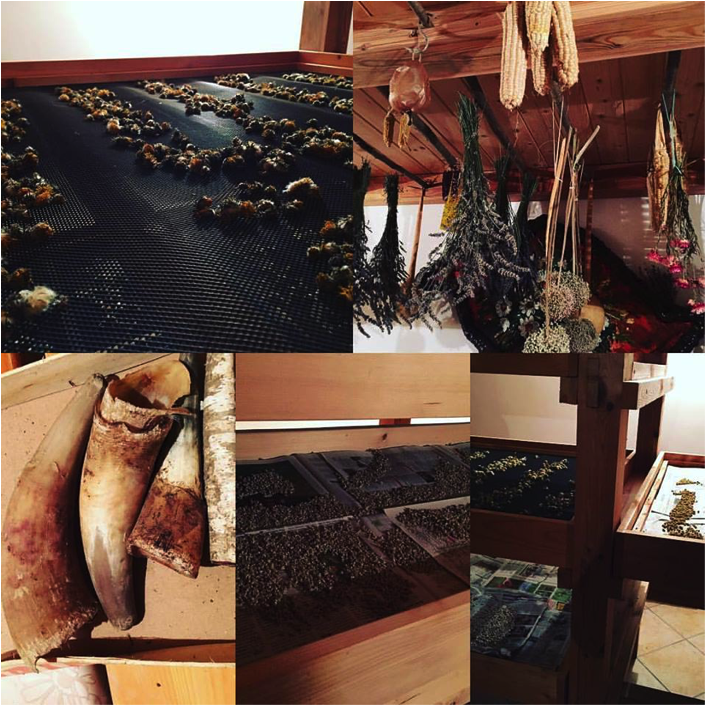 Yarrow, chamomile, valerian, dandelion blossoms and are being dried on wooden trays alongside beans, other plants, extracts (oak bark powder, for example) and dried vegetables are suspended from beams and racks. Nothing is wasted; everything is done for a reason. Delving deep into old historical texts Božidar has developed a “beyond-Steiner” holistic philosophy. What makes it attractive is how it incorporates every aspect of natural life into a single vision; it improves the quality of farming by putting the human into the natural equation. Winemaking, which takes place in the small cellar underneath the house, chimes with the nature of the farming. Božidar works with old Slavonian egg-shaped foudres as well as smaller barrels, and, interestingly, with small qvevri (brought back from Georgia in the early 1990s) buried in the open air just outside the house. He insists that not only must the wine have its feet in the soil but it should also be looking up to the stars (so to speak). The labels on the bottles have a symbol denoting no mobile phones allowed. We surmised that the electromagnetic waves emanating from said appliances might disturb the cosmic essence of the wine, but instead it was for the simple reason that those who spend their time checking or gazing at their screens are not focused on the wines themselves! Quite right. The other significant thing was the temperature of the wines – Božidar believes that they are most eloquent when between 16 and 22 degrees. And so to the wines. They fill the glass in every sense, dense unfiltered liquid. They radiate warmth (and not just because of the temperature they are being served at). Couve is Laški Rizling 70%, Renski Rizling 30%. Grapes are harvested by hand, then destemmed before going into 70% barrel and 30% amphora – Laski into barrel, Renski into amphora. The length of maceration on skins depends on vintage and grape. The Dolium is 100% whole cluster Muskat Ottonel with the whole fruit going into the amphora (juice, skins and stems) for six months. The wine is then decanted off the marc and then remains in amphora for another six months, until the next harvest, when it is transferred into wooden barrels for yet another 12 months. This is a sensational amber/orange wine, at once hedonistic yet with a powerful deep-rooted sense of place. A living wine that changes by the minute. The grapes for the Renski and Laski Rizlings are destemmed and macerated in open “bucket” (škaf) as it is important that a lot of oxygen is involved in the process of maceration. When maceration is finished, everything goes to the press but just to drain it, without pressing anything! What is left from grapes goes to make brandy. Renski has a beautiful bronze colour and the merest suggestion of golden peach. Like all the Zorjan wines there is an earthiness, a rich textural component, and leesy spice. The longer it is exposed to air the more focused it becomes. Laski (the same grape as Welschriesling or Riesling Italico) is less aromatic and a tad more herbal but has great intensity and length. Vivid aromas of ripe citrus fruits, spiced apples and plums. The palate is well-structured, taking only a gentle influence from the skin maceration, with beautiful fruit supported by subtle herbal/earthy characters.